On a whim I dug out Khold's 2008 album Hundre År Gammal and found myself wondering what Gard and co had been up to since then. 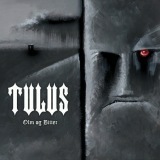 Checking out Tulus' recent activity led to the realisation I'd missed something from earlier this year, a follow-up to 2007's nicely experimental Biography Obscene which expanded the group's groovy black metal palette with piano, trumpet, violin, and other instruments that lent their music a whole new dimension. Unfortunately the band haven't continued down that rich route, preferring instead to go back to the stripped-down bass-heavy black metal that they're known for. And with most of the stoner elements that gave Khold its rocking enjoyability not present, Tulus in 2012 are a cold beast indeed, the icily atmospheric whallop of their music as present as ever and - being fair to the band - still highly effective. Yet so used are we to this formula by now that only the most rabid of rabid fans will be eager to snap this up, as chances are you've heard it before. All of the songs here follow much the same route, atmospheric mid-paced black metal with moments of speed, all short and to-the-point (only one track goes above four minutes in length) and all about as gripping as that remarkably dull cover art - grey and cold. The listener might as well not exist for all the effort the band make to throw in catchy elements; only a hint of Khold's usual danceability is notable in places like the intro to the crushing Angst and in closer Labyrint. Elsewhere, the drab bass-heavy pummelling of Tunge Dråper fra et Mørkt Hjerte draws you in, the vocals having an extra bit of desperation to them which gives the music an added overlay of interest. Bitt's opening melancholic meander setting the mood well before raging metal destroys it. The groove fits like clockwork, it's like listening to a machine at work, capable yet uninteresting. Touches of genius in their minutest are quickly swallowed up the drab grey groove-by-numbers that we're used to from the band. A bit more effort in that regard and Olm Og Bitter would have been spiced up considerably. As things stand, this is by no means a bad album, but neither is it an exciting one. It does its job, and does it well - if you like the style, you'll like this. Tulus really need to keep progressing if they want to retain the metal world's interest - but fans will find this enjoyable, as indeed will anyone new to the Khold/Tulus duo.